Naturally I was excited to see another version of my fave Gen 1 Legendary birb coming out, so now it’s time to figure out if Articuno-GX is all the hype I’d give it. I mean it wasn’t enough to hit the Top 10 list but still. Articuno-GX is a Basic Water Pokemon-GX, 170 HP, with a Metal Weakness, no Resistance, and a Retreat Cost of 2. Legendary Ascent is the Ability, which lets you switch Articuno-GX with your Active Pokemon when you play it from your hand, and if you do that, you get to attach Water Energy from your other Pokemon onto Articuno-GX. This is perfect for its Ice Wing attack, which is 3-for-130 vanilla, or its Cold Crush GX, which only costs 1 Energy but discards all the Energy off of both Active Pokemon. Honestly I think there’s a bit of potential for Articuno-GX to be part of a useful stall deck of sorts. Cold Crush GX can be used early on to keep your opponent’s Active Pokemon from attacking, or it can be a great incentive for them not to attach any Energy to their Active Pokemon if they don’t want to lose it all immediately. Combined with some Hammers, you could be knocking off enough Energy that you get to Ice Wing easily enough, and once you’re at that point, Articuno-GX can 2HKO anything in the game! Even if Articuno-GX comes up later in the game, Legendary Ascent can let you swap around with another copy of Articuno-GX that’s damaged and immediately start walloping the opponent with Ice Wings again! But there are some problems with Articuno-GX as a strategy. While Legendary Ascent is great to get him all powered up, that’s reliant on you having a few Energy on the board already, so you can’t just play him down whenever and expect to go fully swinging with Ice Wing. On top of that, you don’t want to use Cold Crush GX at a time it wouldn’t be so useful – getting rid of a basic Energy isn’t that great a trade, but you especially don’t want to use it while Articuno-GX is powered up fully to Ice Wing. At the same time, once you’ve used Cold Crush GX, you’re out of GX Attacks for the game, which means it’s better to wait on it so you can hit something really valuable with it, like a DCE or Beast Energy <Prism>. I think Articuno-GX has some merit in a few decks, but it’s mostly going to be a secondary attacker. Ice Wing is great to keep smacking away at anything for 2HKOs, but eventually the opponent’s bound to catch up. Unless of course they’re reliant on super-costly attacks, in which case Articuno-GX will likely sweep through them. Energy acceleration though is something to be wary of, since there are a few Pokemon that can cycle back the Energy you get rid of with Cold Crush GX. In the right build, Articuno-GX can definitely shine! …and also it one-shots Fire Pokemon. Period. Arora Notealus: Funny enough, Articuno-GX actually is an update of sorts to Articuno-ex – lowercase ex, not EX – from EX FireRed & LeafGreen. 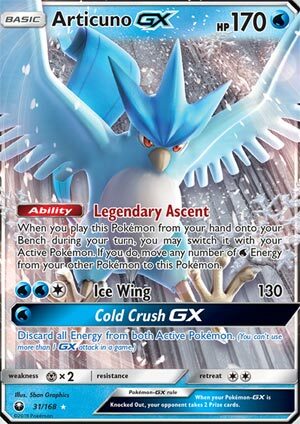 Legendary Ascent is still shared, but Cold Crush got upgraded to a GX move that discards all the Energy while Ice Wing took over as the regular move that costs 3 Energy. Pretty neat to see how all the changes affect the card’s playability! Next Time: When you wanna make the most of life, you go make friends with everybody! We begin the week with Articuno-GX (SM Celestial Storm 31/168, 154/168, 171/168), which is a spiritual successor to Articuno-ex (EX FireRed & LeafGreen 114/112). As a GX Pokemon, usual traits include improved stats, possibly better attacks or abilities, a GX attack, gives out two prizes, and may be helped or excluded by other cards. Being a Basic is the best for the usual reasons, saving deck space as well as being put into play easily as opposed to evolutions. Being a water type means hitting most fire types and some fighting types for weakness, as well as benefitting from type-specific support from other cards, which is too much to list here. Being weak to metal depends on what deck is popular to be considered a risk, and 170 HP can go so far. And a retreat cost of two puts you in a spot where you don’t want to pay this but sometimes have to. Articuno-GX has an ability and two attacks. The ability, Legendary Ascent, works when you play this Pokémon from your hand onto your Bench. You may switch it with your Active Pokemon. Additionally, you may move any number of Water energy from your other Pokémon to this Pokémon. As with Tapu Koko-GX, this is a very useful ability that can help get from zero to attacking. Like Tapu Koko-GX, Articuno-GX also has a three energy attack. Ice Wing costs WWC for 130 damage, enough to 2HKO anything unboosted, but can push into OHKO levels if you’re willing to commit resources. With Choice Band and Professor Kukui, you’ll hit for 180 damage, which covers some of the Basic EX/GX Pokemon. And then there’s Cold Crush GX, which discards all energy from both Active Pokemon. I don’t think this attack is a fair trade off unless you can’t pull off Legendary Ascent and just attach a single water energy. It is still useful against some Pokémon who loads up lots of energy as it strips all the damage from Gardevoir-GX. So how do we use Articuno-GX? Much like Tapu Koko-GX, there can be one strategy that sometimes work. The idea would be to supply healing and bounce cards and use them just after you used the Legendary Ascent ability, so that you can flush off all the damage the previous Active Pokemon had. As of the Sun & Moon format, there’s Acerola, Super Scoop Up, and Max Potion to facilitate this strategy. Expanded adds AZ and Scoop Up Cyclone to the mix. Preferably, bounce cards are more useful than healing. Not only you flush all damage, but you also keep all the cards attached to it (except for AZ). You can even preserve Pokémon Tools! This can very well form a quad Articuno-GX deck. Being a water type, you can easily fuel energies with Aqua Patch so that pulling the ability off sounds reasonable. So you know that this is a modernized print of the old Articuno-ex which is reviewed once by the crew (https://www.pojo.com/COTD/2004/September2004/10.htm). It is a Basic Water type with 110 HP, weak to metal, retreat cost of two, and also gives up two prizes. Same Legendary Ascent that does the same thing as today, and the only attack it has was Cold Crush. It costs WWC for 50 damage and it is optional to make both Active Pokemon discard an energy attached to it. The reviews received mixed reception and I don’t recall any tournament success (which is not my expertise). So the difference between the two is that Cold Crush was branded with the GX status that can be only used once per game, but adds a filler attack that is enough to 2HKO anything based on printed HP scores, and the Ability compliments the attack well. This is a solid card for what it does. In Limited, this could be a good pull if you have another Basic Pokémon if you really want to make the most out of this card, because if you are doing it in a +39 deck, then it’ll take three turns to actually attack, and it’s HP won’t be enough to last getting you your third or fourth prize. Articuno GX (CES 31) swoops back into the Pokemon Trading Card Game from the Celestial Storm expansion set. This 170 HP Basic Water Pokemon has an ability and two attacks. Legendary Ascent allows you to switch it with your active Pokemon. If you do decide to switch it, you can move any number of energy from any of your Pokemon to this Pokemon. Essentially, it’s a Water type Tapu Koko GX. Its main attack Ice Wing does 130 damage for two Water and a Colorless attachment, and its GX attack Cold Crush can potentially disrupt your opponent because for a single Water energy attachment it allows you to discard all energy off of both active Pokemon. Right now, Articuno GX is extremely underwhelming. Its HP is low, its attack is mediocre in comparison to other Basic Pokemon, and its GX attack definitely ranks as one of the worst in the game. I’ve only faced it three times since the new rotation, and I’ve beaten it all three times. Maybe at some point in the future Water Pokemon will get some kind of damage booster. Maybe Water Pokemon will get a Pokemon with an ability similar to Max Potion, or maybe we’ll get something that provides immunity to any Pokemon that are in their first turn in play. Those are all scenarios where Articuno GX might have some potential, but as the meta stands right now, this Pokemon is a pass for me. It’s interesting how some Pokemon seem to be deliberately underpowered compared to others. This Pokemon is extremely comparable to Tapu Koko GX and is clearly the inferior card, and Tapu Koko GX doesn’t even see that much play. The designers had to know that Articuno GX would not see much action in the current meta, but maybe they have cards in mind in the future that might make Articuno GX much more interesting. Articuno-GX (SM – Celestial Storm 31/168, 154/168, 171/168) is a Basic [W] Pokémon-GX with 170 HP, [M] Weakness, [F] Resistance, Retreat Cost [CC], the Ability “Legendary Ascent”, the attack “Ice Wing”, and the GX-attack “Cold Crush-GX”. Legendary Ascent may be activated when you Bench this Pokémon from your hand during your turn. If you use it, the first thing you do is switch your current Active with this Articuno-GX. Then you can move the [W] Energy from any of your Pokémon to the Articuno-GX that Legendary Ascent just promoted. You can choose to move no Energy to Articuno-GX, all [W] Energy, or an amount in between and you can pull from any (and up to all) of your other Pokémon. Ice Wing is a straightforward 130 damage for [WWC], while Cold Crush-GX needs [W] to discard all Energy from both Active Pokémon. This card appears to be based on Articuno-ex (EX – FireRed & LeafGreen 114/112), though its regular attack debuted on Rocket’s Articuno-ex (EX – Team Rocket Returns 96/109) and also showed up on Articuno (BW – Next Destinies 27/99; BW – Legendary Treasures 32/113). Articuno-GX is on the small side of normal for a Basic Pokémon-GX, but not cripplingly so; it still isn’t an easy OHKO, by which I mean most decks need a solid (if not complete) set up to take it down in one hit. The exception being Weakness; I’m glad Articuno-GX didn’t get saddled with the soon-to-be-deadly [L] Weakness, but if you run into an [M] Type deck expect any serious attacker to score an easy OHKO (and even some less-than-serious attackers). [F] Resistance might come in handy; Buzzwole alone provides the Type with a serious presence. A Retreat Cost of [CC] is mediocre; you can probably pay it if you need to, but its pricey enough you’d rather not. Legendary Ascent could be brilliant, but there are a LOT of little things required for it to be so. The most important is finding something that uses compatible Energy and can lead for it. Possibly, that could be itself though the HP makes this iffy. Unlike the original, this version of Legendary Ascent works with any Energy that provides [C], so cards like Rainbow Energy or Unit Energy [G][R][W] are fair game. This might be a red herring, or it might give Articuno-GX more potential partners. Ice Wing is 10 to 30 points of damage shy of what it really needs. 130 for the Energy being invested is solid BUT when you look at the actual metagame, that means even with a Choice Band Articuno-GX will whiff on OHKO’s against 170 to 190 HP Basic Pokémon-GX. It is still enough for reliably 2HKO’s, but even with Legendary Ascent shenanigans, that might not be enough. The GX attack is for a different metagame, I’m afraid. Even if you only have [W] attached to Articuno-GX, you’re trading your once-per-game GX-attack to discard not much Energy, at least in most decks that won’t have Energy acceleration themselves and/or attackers that do their thing for a single Energy attachment. It isn’t hopeless; not all Energy acceleration is reusable or inexhaustible, and it can still hurt when you nail Special Energy cards that aren’t easily replaced, but how many decks can use Crushing Hammer, Enhanced Hammer, Kartana-GX, etc. and then save their GX-attack for a reliable OHKO or useful trick. Articuno-ex had a solid deck back in the day, alongside Moltres-ex (EX – FireRed & LeafGreen 115/112) and Zapdos-ex (EX – FireRed & LeafGreen 116/112). The other two Pokémon-ex also had Legendary Ascent, but working with their respective basic Energy Type instead of basic Water Energy. All three of these cards had attacks with [XXC] Energy costs, where [X] matched their own Type PLUS each attack had a bonus effect based on discarding an Energy (any Type). Obviously, going from one bird of the same Type to another meant you could try and recycle all attached Energy, but by mixing you could have Energy for another Type accumulate as well. While they didn’t have the exact same tricks we have right now, they did have some similar things… or exactly the same thing, such as in the case of Super Scoop Up. Using all three birds allowed the deck to cover a wider variety of Weaknesses. So… could Articuno-GX do the same thing now? Though it is friendlier to type-mixing thanks to Articuno-GX’s version of Legendary Ascent working with Special Energy, we have more forms of Weakness to cover and [R], [L], and [W] Weakness isn’t particularly important right now. Oh, and we don’t have a Moltres-GX or Zapdos-GX with Legendary Ascent. Couldn’t use you this trick just with Articuno-GX? Yes, but like I said you’re whiffing on OHKO’s against most basic Pokémon-GX without help while not being especially durable yourself. Articuno-GX might be best saved as a trick for decks with sufficient [W] Energy, be they actual [W] decks or just something that runs a lot of Rainbow Energy. At least your first Articuno-GX or [W] Type attacker, in a deck fueled by basic [W] Energy, can use Aqua Patch to ensure a swift open… which might be what leaves a niche open for Articuno-GX. All copies of Aqua Patch in the discard while your current, [W] Energy fueled attack is about to be KO’d via accumulated damage? Drop a copy of Articuno-GX and keep on attacking. It’s just can’t think of a current, competitive Standard Format deck where the above scenario is likely to happen. It gets worse in Expanded; while there are more tricks for it to take advantage of, it is still trying to fit into a crowded niche. Oh, and while this is very good in the Limited Format, that is splashed into another deck that has room for it and at least a few basic Water Energy cards. If you use this in a +39 build, Legendary Ascent does you no good and Cold Crush-GX probably won’t do you much good either; it’ll be Ice Wing or bust!